I've seen this guy 'surfing' down the River Itchen a couple of times now. I'll bet it's not as easy to do as he makes it look. I suspect I'd end up in the drink the first boat that goes past me. This does look fun though. 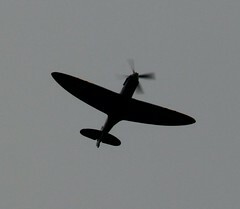 Saturday brought more aircraft related diversions, in the form of a Spitfire this time. This flight was in celebration of the 75th anniversary of the first Spitfire flight. Southampton was where it all originally started. There were a good crown of people braving the cold up on the Itchen bridge, and probably far more at Mayflower park in Southampton itself, for what was a very quick fly-by. Not much of a picture, but the plane was over me and gone so very fast. I had spent some time fiddling with the camera settings for that perfect shot, but inadvertently used the wrong metering mode so only ended up with a silhouette. Friday night's peace and quiet was somewhat disrupted with this Coastguard helicopter overhead, up and down the river, while it was searching. 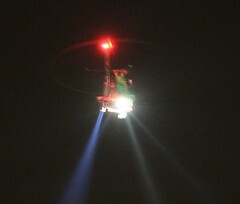 From time to time people end up in the river at night, for whatever reason, and search and rescue, including the Coastguard helicopter, get called out to search the Itchen. Where it's obvious they are searching my stretch of the river I feel an obligation to keep a lookout myself, thinking that if I had fallen in and got swept away I'd like to believe that others were keeping an eye out for me. Fortunately, for all concerned, this occurrence is relatively rare. It also serves as a reminder to me that extra care must be taken at night, especially when the water is so cold. In the event, it turns out that this call was a hoax and to add insult to injury someone also saw fit to point a laser at the helicopter cockpit. Here's a picture of the barge which is moored just in front of me. You can see the wood cut from my deck neatly stacked down below there, serving as ballast for the thing. If you look at the end furthest away, you can see a notch cut into the deck. 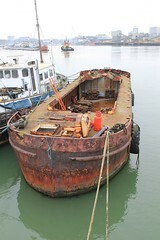 This is to accommodate the yacht the owner is planning on balancing on the barge. The plan is the barge acts as a floating workshop. It will be interesting to see what progress is made there as time marches relentlessly on. 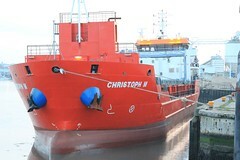 A little bit more on the Christoph M.
Often when these boats tie up and the tide goes out, they end up listing somewhat as they come to rest on the bottom. This is certainly the case with the Christoph M, but she also appears to have slid out sideways to deeper water on the muddy bottom. If you look closely at the gangplank, you will see it's somewhat shorter than the gap there. This used to happen to my platform in Fareham. The tension on my ropes worried me in the beginning, so the crew had to have been somewhat concerned for their mooring lines, and the possible consequences of them parting.